Are you looking to create a website which looks like WPBeginner? Then here is the best guide to making a website like WPBeginner. We will know how to make a website like WPBeginner using WordPress. WPBeginner.com is the largest WordPress resource site for WordPress Beginners with understanding WordPress tutorials. According to WPBeginner’s blueprint, it uses its own custom theme which built by Genesis framework. Unfortunately, this WPBeginner theme is not available for download and use. 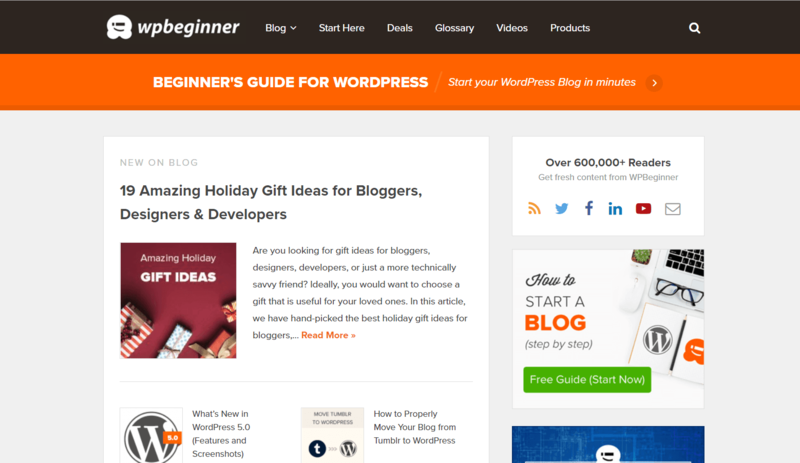 But here is another free WordPress theme HappyThemes’s Starter which perfectly looks likes WPbeginner. This theme can be downloaded free from HappyThemes. WPBeginner Hosting is HostGator hosting. According to their blueprint the uses HostGator VPS. If you like to buy hosting at a very cheap price, look at the list of the best cheap web hosting in India. To create a website you also need a domain. You can buy a domain at an affordable price on Godaddy and BigRock. You need to install the Starter theme which about I talked in step 2. Follow this given below step to install your theme. Step 2. Go to Appearance > Theme. Step 3. Choose Add New option. Step 4. Click on Upload Theme. Step 5. Choose the theme zip file and click on Install Now. Step 6. Click on Activate. Now your theme is activated. After activation, it asks you to install a coupon plugin. After installing the coupon plugin, your site is ready. Now you set favicon, logo, menu and footer text in Appearance > Customize section and widgets from widgets section. Now your website is ready. Add new coupon from coupon option and write new content regularly. If you have any question and enquiry, please ask in the comment section or contact us the page. If you liked this “Make a website like WPBeginner in 1 minute – Ultimate Guide” tutorial, follow us on Facebook, Twitter and Instagram.